Failed to mount database 'Public-Folders-prod-ex2010-01'. 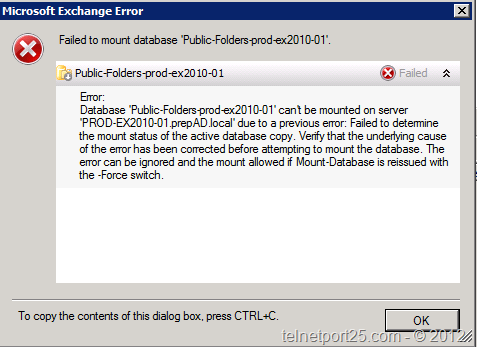 Database 'Public-Folders-prod-ex2010-01' can't be mounted on server 'PROD-EX2010-01.prepAD.local' due to a previous error: Failed to determine the mount status of the active database copy. Verify that the underlying cause of the error has been corrected before attempting to mount the database. The error can be ignored and the mount allowed if Mount-Database is reissued with the -Force switch. I used the Start-Service cmdlet (see below) and I was able to mount the Public Folder store correctly. Exchange 2010 is not a clustered application. Instead, it uses the cluster library functions implemented in clusapi.dll for cluster, group, cluster network (heartbeating), node management, cluster registry, and a few control code functions. In addition, Active Manager stores current mailbox database information (for example, active and passive data, and mounted data) in the cluster database. Although the information is stored directly in the cluster database, it isn’t accessed directly by any other components. If the cluster service is not running, then access to the cluster database is not possible – therefore the Active Manager cannot determine the previous state of the database for databases which are resident on the node – this includes Public Folders. Thanks, Andy! This was exactly what I was looking for. I had very carefully shuffled around the active copies of databases in our DAG while performing reboots of the member servers, and after all the reboots were completed I redistributed the active database copies and everything looked like it was running fine. A while later, though, I found that the Public Folder database was not mounted, and when I tried to mount it I received the same error that you did. 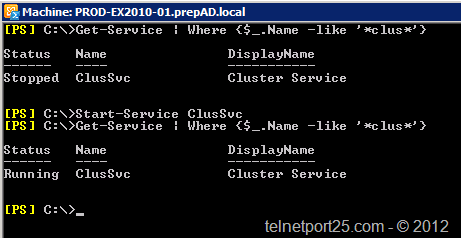 I performed the service check and found that the Cluster Service was stopped; I started it up and the Public Folder database automatically mounted itself. I just ran into the same problem this morning. The Cluster service was stopped. I started it and then I was able to mount our Public Folders Database. Thanks for the solution. However, now my questions become: Why would the cluster service stop? And why did that not cause problems with my 2 mailbox databases? Jake, I presume that you had no problems with the mailbox databases as they failed over to another member of the DAG when the cluster service stopped. Public Folders are not DAG enabled (although depend on the Active Manager) therefore a local to each mailbox server.